Though the royal guards in front of Buckingham Palace can be interesting to watch — all their pacing and stomping and saluting can be quite dramatic — you never get all that close to the action. There are large gates, big crowds and a lot of distance between you. It’s not like in the movies where you can go up and mess with the guards next to their stations. 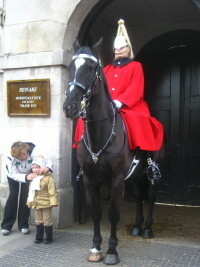 Horse Guards Parade is more like the movies, but with horses and much stranger uniforms. 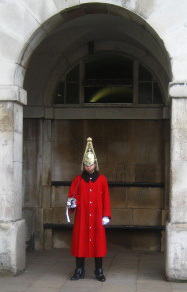 The guards have long red coats, boots they can barely walk in — their stomping and walking is much mor awkward than the other guards’ — and hats with what I’d describe as horse-haired scepters up top. Oh, and they also have big swords. That may be the best part. This building is right on a busy street and there are guards outside, with tourists close enough to trip over them, who have giant swords on their shoulders. Also, many of the guards look really young — the one in the archway looked like he could still be in high school. His uniform seemed to big, and he didn’t seem to be terribly adept at standing still yet. We came to Horse Guards Parade through the archway from St. James Park. The building and guards originally served as the entrance to Buckingham Palace, but since the park and other streets near it are now open, it only serves a ceremonial purpose. Still, seeing those big horses standing in their archways — with warnings that they can bite or kick you — is a bit imposing, though doesn’t seem to stop people from getting quite close and even putting their kids near the horses’ hoofs (see the photo). And the tourists here seem sillier than in other parts of the city, standing next to the mounted and unmounted guards and taking photos like the guards were inanimate objects, and cramming into the nearby phone booths to take photos. Evan and I didn’t get into any photos with the guards. It just seemed a little weird. We’ll still gape and take photos, though.